Pizzazz pouches offer a high quality, decorative opportunity to enhance your prints. Choose from a variety of finishes including Classic Frames and Fun Frames to outline your prints. Pizzazz pouches are ideal for awards, photos, announcements or any print you want to stand out with a decorative border. These wonderful fun and creative pouches are 3.0 mil thick and will work in almost any pouch laminator. These pouches have superb clarity and offer exceptional value for reasonable prices. Plus, every box of pouches comes with a carrier to help prolong the life of your laminator. Size: 4.25" x 6.25" or 9" x 11.5"
Welcome to MyBinding video. Crafters and teachers you can now unite. 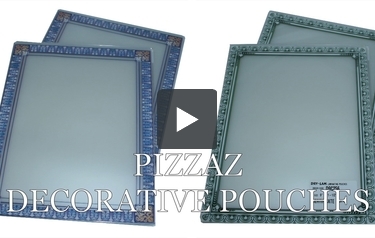 Pizzazz Decorative Pouches make lamination not only easy but decorative as well, with no extra work. They all come in 3 mil thickness, work in almost any pouch laminator and have fun and classic designs. So if you have a set of themed photos or want to do something extra special with your classroom or kids, think Pizzazz. For more demos, reviews and how-to’s, check out MyBinding.com.